Famous people born on OCTOBER 15 are special individuals. This Libra is the kind of person that loves touching, giving hugs and playing footsies. In love, they feel as though they are on top of the world. It’s easy to see as they have that permanent smile on their face. Having someone to come home to makes working and providing those niceties in life worthwhile. While they are righteous, they have some problems with their temper. Their fuse is really short and sometimes, they don’t have all of the facts before they get upset and blow up. This hasn’t stopped anyone from liking them but it could put a temporary damper on things. Most people know them to be a clever and dependable Libras. They need to find a common ground and work things out before they start yelling at people. 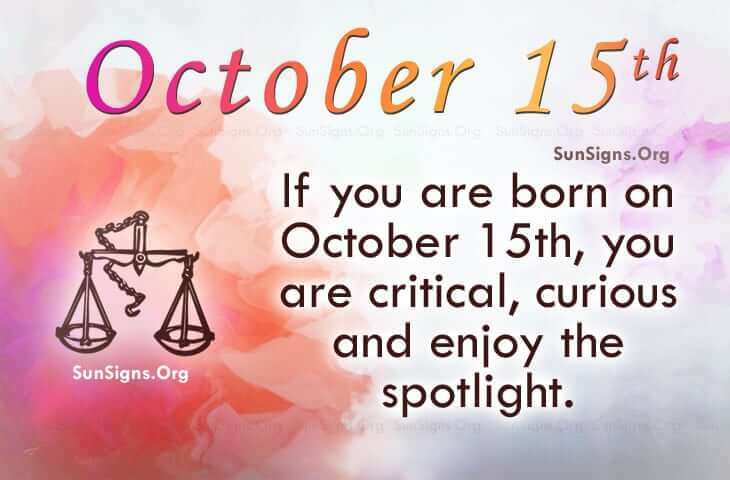 Usually, famous people born on October 15 make a good living and are active. But they would do well to not tell anyone about their latest windfall. Not everyone is honest and those are the people who want to use them. They know who they are by the conditions of their weather. Learning to say no is likely one of the hardest things they’ll ever have to do in life but they can do it. Practice makes perfect, my friend. Famous people born on OCTOBER 15th are Libra who are critical and curious. They will enjoy the spotlight as opposed to others born under this zodiac sign. Their lover must be loyal or they would rather be alone.